Content curation is an increasingly popular marketing strategy that yields multiple benefits. And, chances are, you’re using content curation without even knowing it. For the uninitiated, content curation is the act of sifting through content sourced from the Internet and compiling only the most relevant and valuable information that suits your objective. For example, if you’re a travel blogger, you would compile articles, videos, infographics and other content pieces on where to go for your next holiday, or where the best beaches in the world can be found. The general misconception is that content curation is merely collecting information and posting it on your blog and social media sites. Not so — the difference between content curation and copy-and-pasting is that with the former, you would hand-pick only the best content and put your own unique spin on it. In other words, you would offer something of value on top of the information you are about to present to your network of friends, connections and followers. Serious about content curation and the results you can potentially enjoy as a publisher or marketer? Trap.it has just the right solution for you. It promises “measurable, easy, fast and affordable content discovery, curation and delivery.” All you need to do is type in your desired keywords and Trap.it will gather authority articles from the Internet. No more excessive trawling the web for the right kind of content that would showcase your authority. Paper.li is a firm favorite amongst content curators, allowing great content to be discovered and shared on your “self-published” online newspaper. Whether you’re passionate about the subject of social media, business or even biochemistry, this service lets you curate the most relevant and engaging news around the world. Want more customization (for example, publishing a Paper.li newspaper with your own logo)? 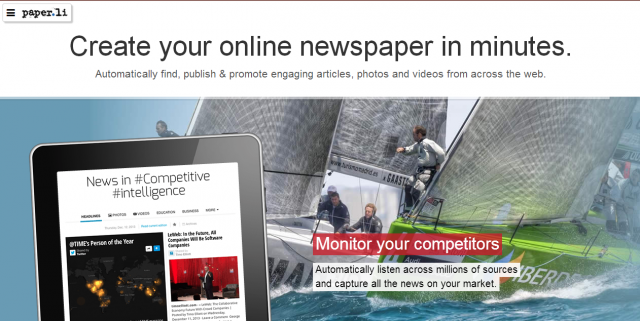 Check out their premium features, it’s perfect for online media mogul-wannabes. P.S: Load up Paper.li and marvel at their brand spanking new dashboard and optimized mobile experience that brings about a whole new package. It’s cleaner, more streamlined and overall, a real pleasure to use. iFlow is quickly topping lists of great content curation tools everywhere online. More than a content curation tool, this content aggregator helps curation enthusiasts cope with the never-ending ebb and flow (pun intended) of content that floods the Internet each day. You can either automatically or manually aggregate desired content in real-time, thus increasing your thought leadership in your selected niche or industry. Don’t want all the bells and whistles associated with swanky-looking content curation tools? 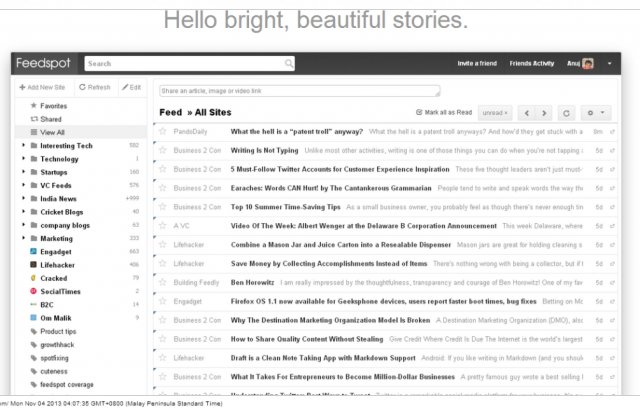 Make a beeline for Feedspot and get this no-frills RSS reader that delivers relevant content in lightning speed. Oh, and you get to customize your homepage newsfeed, too. I don’t know about you, but if I can’t manage my Twitter stream well, I may as well not tweet at all. Imagine the chaos if there weren’t handy tools like Hootsuite or Tweetdeck to help us manage our accounts. 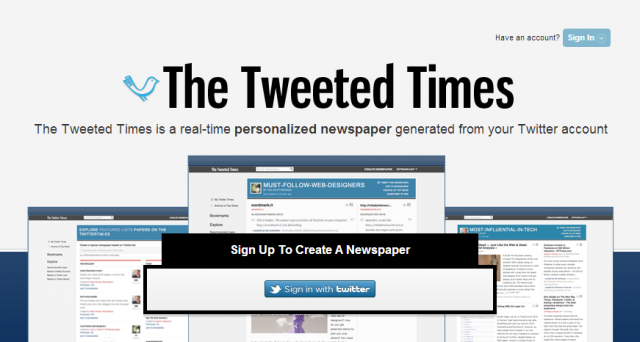 The Tweeted Times helps you curate the best gems from your Twitter stream and place them neatly inside a customized newspaper. Create specialized Twitter Lists or Twitter Search terms and your newspaper will be fueled with the latest news that matters most to you. Love lists? Can’t do without them? If so, you probably need List.ly in your life more than a bee needs flowers. You can virtually create an endless stream of lists, adding tags and descriptions as you go as well as getting other people to collaborate on your lists, making curation a truly crowdsourcing effort. ContentGems is a marketing-centric content curation tool that taps into 200,000 news sources, websites and social media entities all over the web. You can choose what you want to see based on your desired keywords – you even get to choose what sort of content to avoid. 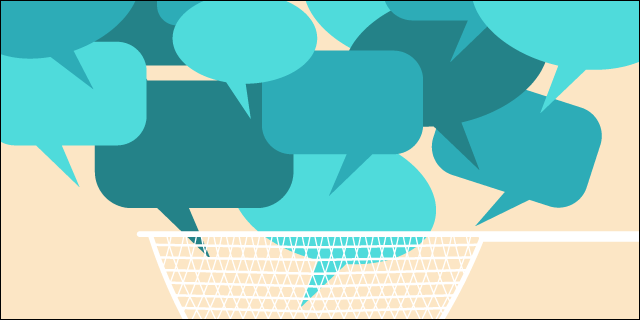 Besides being able to increase your thought leadership, you can also monitor what everyone’s saying about your brand. Do note that the free version lets you create a maximum of two Interest lists. 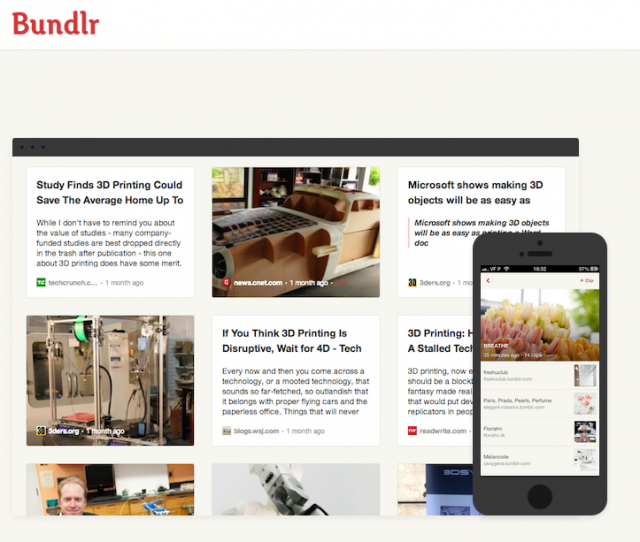 Bundlr lets you “create and share bundles and content.” So, that’s pretty similar to the other content curation tools out there. The difference is, you can track when and where your Bundled content visitors originate from. This is a useful feature that comes with the premium version at a low annual fee – definitely worth paying if you want to track your content curation efforts and see what sort of results they yield. This useful tool’s one-click publish feature continues to be the talk of town. Those who think that Scoop.it is just another tool that lets you curate stuff and “make” your own newspaper, well, you’d be surprised. The visual format for Scoop.it is a little less… shall we say, constricting, compared to a newspaper. Don’t forget to make use of the Scoop.it Bookmarklet that lets you “scoop” appealing content and then adding your own annotations or notes to make it unique. Used by a multitude of big brands including Al Jazeera, Cisco and The Washington Post, Storify takes your content curation to the next level. Unlike other content curation tools that let you create and publish your own newspaper, Storify gives you the means to build a multimedia-rich timeline that you can fill up with breaking news, tweets, photos, videos and other form of content. If Storify sounds like a great tool you can use for a long time (and believe me, it does), you may want upgrade to Storify VIP that gives real-time updates and in-depth customization. Want to stay ahead in the content curation game with Storify? It’s up to you to discover the various types of content that would make awesome Storifys. Nikhil Jain is the CEO and Founder of Ziondia Interactive, and has almost a decade's worth of experience in the Internet marketing industry. When he is not dabbling in SEO, media-buying and other forms of marketing, Nikhil finds pleasure in taking photographs of clouds, and ponders why he refers to himself in the third person.